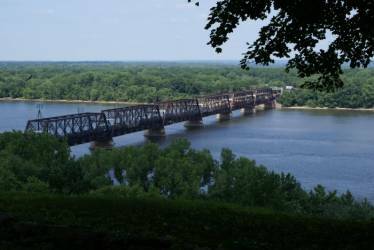 The BNSF railroad bridge over the Mississippi River in Burlington, Iowa (the first all-metal bridge over the river) has withstood years of punishment from the heavy barge traffic on the river. It ranks third on the US Coast Guard’s list of bridges struck most frequently by barges. This unfortunate distinction is mainly due to its aging swing span bridge design, which limits the navigation channel under the bridge to a width of only 150 feet. Renovations began in the summer of 2010 on a new lift span which will double the navigation channel size. Initially, Portland Bolt’s bid for the custom rods was not chosen. After the low price bidder supplied ASTM A449 rods instead of the A354 grade BC rods which were specified in the contract, Portland Bolt was called upon to rectify the situation by supplying 56 pieces of 3-1/2″ diameter X 13′-6″ long galvanized ASTM A354 grade BC rods with 60″ of total thread length. We supplied the correct product to the jobsite in just 4 weeks. Another 56 rods were shipped a short time later. We may not always have the lowest price, but we are often the most cost effective option. Our ability to supply correct product, provide superior quality, galvanize bolts in-house, offer full domestic certification, and provide fast turnaround times has a high value of cost reduction not always recognized in the selling price. The moral of the story… cheap price does not always equate to the lowest cost when all is said and done. Consider using Portland Bolt to supply all your nonstandard construction fasteners when you need it done right the first time!